Old post, still Hassids on bikes | Hipsters and Hassids: The painting series. The phenomenon. Williamsburg, NY – An unusual sign appeared in the neighborhood. On it is a large Star of David constructed out of 50 or so rubber chickens. In the middle of the star, Yiddish text offers a free bike loan to any of the Yiddish-speaking Satmar Hasidim who live in the area. “You can come borrow a bike to ride around and have fun,” the sign reads. Baruch Herzfeld, a neighborhood gadfly/clown/activist/businessman who owns a small bicycle repair shop below the offices of his cell phone company (the shop’s name: Traif Bike Geschaft), put up the sign. Herzfeld, 37, already has sent some of his Hasidic friends down to the Brooklyn waterfront on the beat-up bikes he has in his repair shop. He just received 500 used bikes from Japan that will allow him to expand his program. Herzfeld’s office is smack in the middle of the divided territory of Williamsburg, a neighborhood that has long been inhabited by Satmar Hasidim but has recently become a favorite of young secular New York hipsters. These two communities have little in common, but they have been particularly divided over the past year by proposed bike lanes through the neighborhood — which the Hasidim have opposed and the hipsters have generally supported. 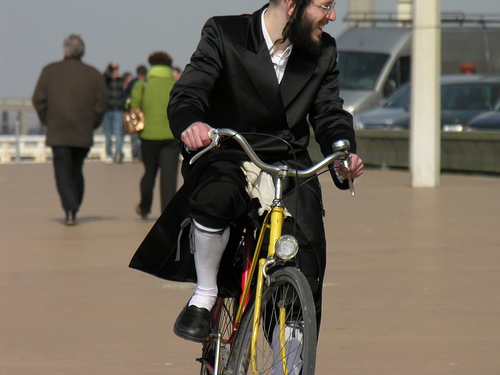 Herzfeld thinks that if he can get a few Hasidim riding bikes, it could ease some of the tension. “The goal is just to make it acceptable. I’m not doing it because I want to change the world — I just think it would be a healthy thing for the whole city if some of these guys got on bicycles,” he said. It’s an improbable plan with a number of barriers to overcome. On a recent afternoon, a black-hatted Satmar man walked by and noticed the sign; Herzfeld told him to come by for a bike, but the man just laughed. “Usually over here, the adults don’t ride. Over here nobody takes two wheels,” said the man, who declined to give his name. If anybody can break these barriers, though, it’s probably Herzfeld. Though not a Hasid, he is a Sabbath-observant Modern Orthodox Jew. Both of his brothers are rabbis — one at the National Synagogue in Washington. But he also is a classic Brooklyn bon vivant: Next to the rubber-chicken bike loan sign is a graffitied picture of Che Guevara, and in back, with the bikes, is a chicken coop, where Herzfeld gets eggs for his wife. He wears a fedora, tilted forward, ironically, and an open-necked shirt — and he shows no fear in challenging the local rabbinic authorities who might look down on his program. The roots of the local resistance to Herzfeld’s thinking run deep. There are some Hasidic communities in which grown men do ride bicycles, but the Satmar world of Williamsburg is not one of them. Simon Weiser, a Hasidic member of the local community board who fought hard against the proposed bike lanes, said that it is simply a matter of tradition. The local attitudes surfaced last fall when the city proposed putting new bike lanes through Williamsburg to accommodate the many young, secular residents who use bicycles to get around. The Hasidic community immediately opposed the lanes, citing the reduced parking they would cause; some religious leaders also mentioned the immodestly dressed women who would come pedaling through the neighborhood. Like his meandering patter, Herzfeld’s approach to this problem has not been a linear one. He says it really began last summer, when his bike was stolen near his home on Manhattan’s Lower East Side. He went online to find a new bike, and he found a police auction site. He ended up buying 500 bicycles at around $8 a pop. Once he had the bikes, he needed somewhere to store and sell them, so he transformed his Williamsburg backyard into the bike shop and brought in one of his many neighborhood friends to run it. This quickly made his two-story building a hangout for local hipsters, as did his decision to donate space on the ground floor to the group Time’s Up, an activist bike collective. Once he had the hipsters, Herzfeld saw the possibility of bringing them together with the Hasidim whom he meets on the street and in the local kosher restaurants. Earlier this summer, Herzfeld got a permit to close off his block and hold an event in which the Time’s Up folks fixed up some of the police auction bikes for Hasidic kids. He has decided to call his lending program a “Bike Gemach,” playing off the Hebrew word for a free loan society. On a recent Sunday, a Hasidic friend of Herzfeld’s, Yoel Buchinger, came by and was taught how to ride a bike by some of the Time’s Up activists. They recorded it on video for posterity. Buchinger said that he has many friends who would be willing to ride, as long as they are not doing so in the middle of the community. “I have a lot of friends riding bikes every day — every night. They ride around the water,” Buchinger said. He still got a parting “Zay gesunt,” or “Be well,” from the man as he walked away. Herzfeld gave him a “Zay gesunt” in return, with a smirk. ← How Many Hipsters fit in a Jazz?